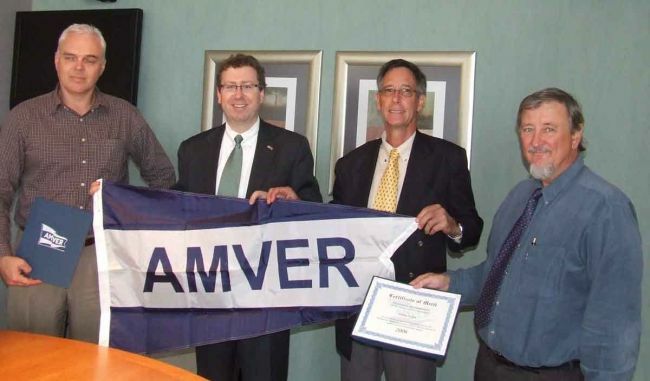 Durban, 22 May – The US Consul General in Durban, Eugene Young yesterday congratulated South African shipping company Unicorn Shipping for its participation in a US Coast Guard worldwide search and rescue programme known as AMVER. Mr Young handed over a certificate and letter to the company for making its ships available in search and rescue incidents on the high seas. The award was made on behalf of the US Coast Guard as a mark of its Automated Mutual-Assistance Vessel Rescue System (AMVER), a US Coastguard safety programme. Consul General Young said that the Amver programme represents the best of international relations. “It is a humanitarian system operated for, and depending on, the co-operation of all the seagoing nations of the world, regardless of flag or nationality. He explained that some 17,000 ships from over 155 nations participate in the computerised system. Each day Amver tracks an average of 3,200 ships on voyages all around the world. If a ship reports an emergency, rescue co-ordinators can query the Amver system and identify other Amver ships in the areas which can be diverted to assist. Oftentimes in the middle of the ocean, another ship is the only rescue resource available. The ability to identify several ships in the area of a distress allows rescue co-ordinators to select and dispatch only those in the best position to assist, thus releasing other ships to continue on their voyage, saving time and money in fuel and crew salaries. Amver data is protected from disclosure as sensitive commercial information and is only provided to search and rescue agencies during bona fide emergencies. On an annual basis the Amver system is called upon an average of more than 200 times and amounts to a saving of at least 300 lives. The type of emergency includes fire and medical evacuations. The Commandant of the United States Coast Guard provides each company with a letter of appreciation, and each ship receives a certificate. Other awards are given based upon the number of consecutive years a vessel has participated. Yesterday’s award referred to the 25,400-gt Unicorn-owned products tanker Stena Tiger, formerly named Oliphant. Unicorn director Robert Young said Unicorn ships have been participating in the AMVER programme since the 1980s.